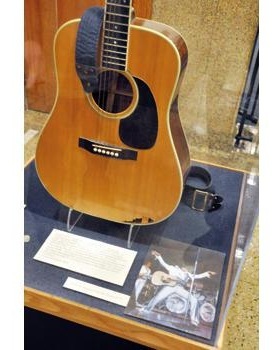 Martin D-35 guitar, played by Elvis Presley, displayed at the National Music Museum in Vermillion, South Dakota. VERMILLION, South Dakota: A 16th-century Amati violoncello displayed in the National Music Museum has long been nicknamed “The King,” but the ghost of a legendary rock ‘n’ roller has arrived in South Dakota to reclaim his regal moniker. A slightly smashed acoustic guitar played by Elvis Presley on his final tour in 1977 now greets visitors in front of the museum’s main galleries. The Martin D-35 was tossed aside by “The King” during a St. Petersburg, Florida, concert after suffering a broken strap and string, said Robert Johnson, a Memphis-based guitarist who donated the item. 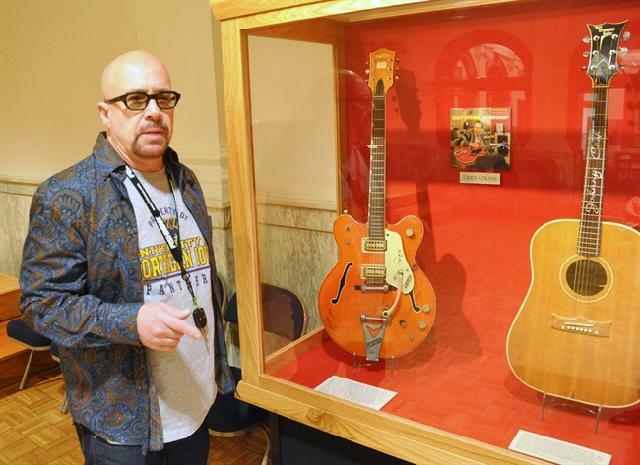 guitarist Robert Johnson, who played in the 1970s with Isaac Hayes and John Entwistle's Ox, talking about the Chet Atkins and Johnny Cash guitars he donated to the National Music Museum in Vermillion, S.D. Johnson also donated a guitar played by Elvis Presley during his final tour and a harmonic played by Bob Dylan. Johnson, who played with singer Isaac Hayes and the band John Entwistle’s Ox in the 1970s, donated the Elvis guitar and four other celebrity items to the National Music Museum, which is tucked away in an old Carnegie library building on the University of South Dakota campus. The museum’s trustees also purchased Johnson’s 1967 Gibson Explorer Korina wood guitar, formerly owned by Entwistle, who’s best known as a member of The Who. Johnson, a longtime collector, also donated a Chet Atkins hollow body guitar given to country pianist Floyd Cramer and later played by Jerry Lee Lewis and Mickey Gilley, a 1966 custom Grammer guitar made for Johnny Cash, a 1961 Kay Value Leader guitar signed by blues legend Muddy Waters and one of Bob Dylan’s Hohner Marine Band harmonicas. Cleveland Johnson, who is not related to Robert Johnson, took over as director in November after the retirement of Andre Larson, who’d been at the helm since it was established in 1973. The museum’s holdings grew out of a private collection owned by Larson’s father, Arne B. Larson, who continually added items while serving as a public school music director. Robert Johnson said he owns some 600 guitars and another 2,000 to 3,000 artifacts, so he began discussions with Andre Larsen in 2010 to get involved with the museum. The museum’s 800 or so instruments on public display are the superstars of a broader collection of more than 15,000 pianos, harpsichords, guitars, horns, drums and other musical items.